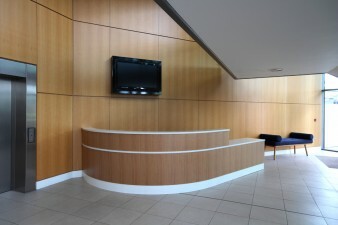 This gallery features projects produced for the corporate environment – reception desks, office furniture, boardroom tables (more of which are featured in the miscellaneous section). 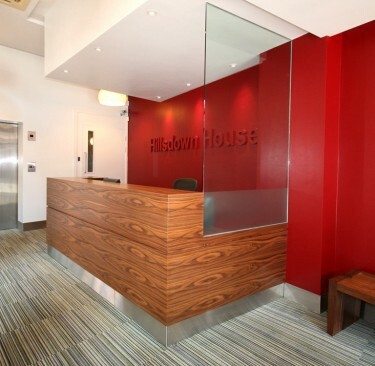 We also cater for those working from home, having designed and made a number of efficient and comfortable home offices. 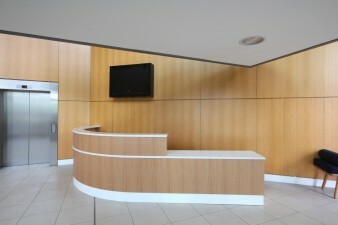 Reception Desk made from American Black Walnut veneer with stainless steel plinth and glass panel. 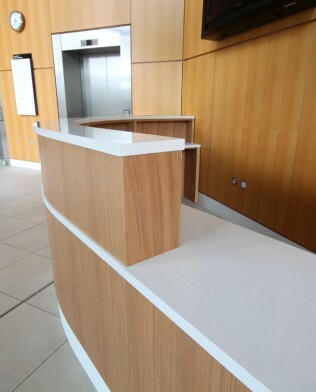 Reception Desk made from Quarter sawn European Oak veneers and composite stone top for the centre court reception at the New England Tennis and Croquette Club. Designed by Opus Magnum. 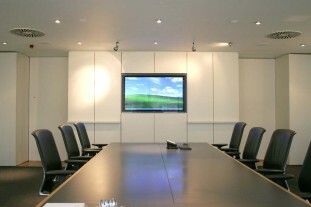 Boardroom media wall – spray-painted. 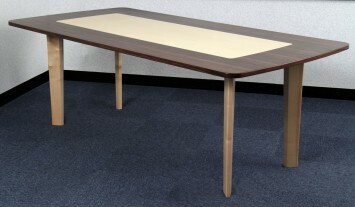 Sycamore and Cherry Meeting Table. 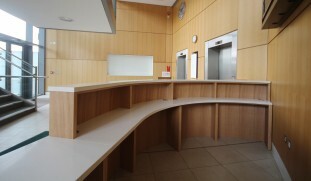 White Reception Desk with wall-hung Company logo made from Oak. Knee-hole Desk made from Macassar Ebony with leather insert. 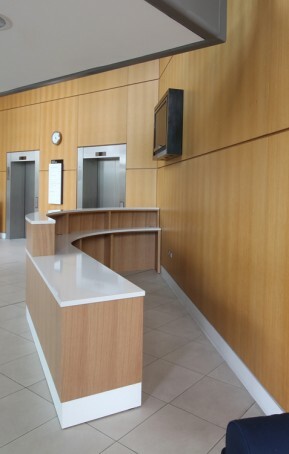 Office Meeting Room Credenza made from straight-grained American Walnut. Designed by Opus Magnum. 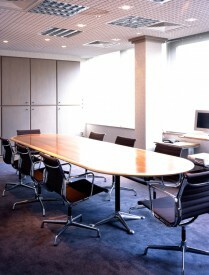 Boardroom Table made from Steamed Swiss Pear, Amboyna, Figured Maple and Rosewood inlay. American Walnut Desk for Kerry Packers yacht. 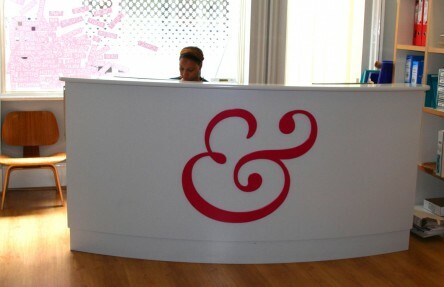 Spray-painted Reception Desk with company logo. 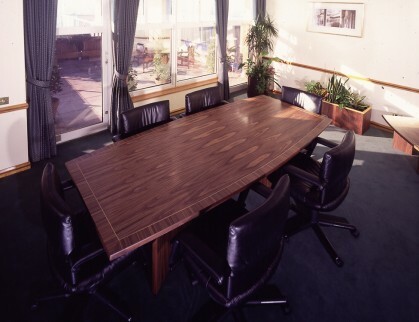 Meeting Room Table made from Rosewood and Sycamore. 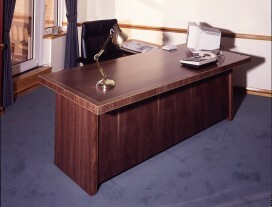 Walnut and Boxwood inlayed Desk for the Chief Executive of the Woolwich Building Society. 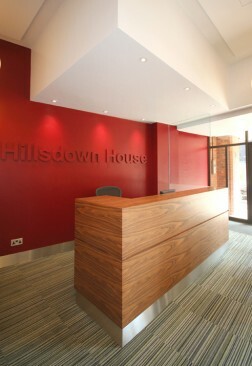 Walnut and Boxwood inlayed Meeting Table for the Chief Executive of the Woolwich Building Society. 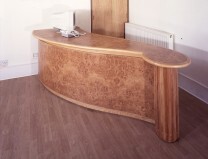 Reception Desk made from Oak and Burr oak veneers. 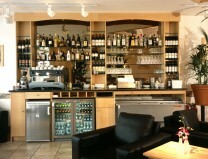 Restaurant cabinets made from Beech. 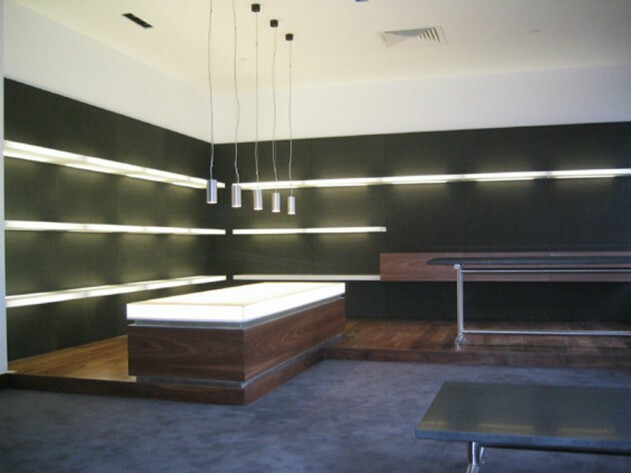 Fabric covered wall panels, Walnut display unit and illuminated acrylic shelves for the Wedgewood headquarters.